New range of relays provides multiple independent setting groups for allowing relay to work on different power system & operating conditions. Basic version provides two independent setting groups. The extended and modular versions provide four independent setting groups. ASHIDA’s ADR239B relay from ADITYA series provides protection for Overhead Transmission Lines, Underground cables. This line protection relay is designed with fast and selective tripping ensures the stability and availability of electrical power system. ADR239B relay is applied for protection, control & monitoring of line radial and ring main feeder to achieve sensitivity and selectivity on phase and ground faults. ADR239B line protection relay provides switch on to fault (SOTF) protection against energizing faulty line by switching on circuit breaker. Fault locator feature in line protection calculates fault impedance and distance to fault based on positive sequence reactance parameter of protected line. ADR239B provides sequence over current protection against unbalance faults/condition or high impedance faults over transmission line/underground cable or over load condition. ADR239B line protection relay is equipped with broken conductor detection protection. ADR239B provides independent I0/I1 function for sensitive ground fault detection. This line protection relay provides built in disturbance recording facility for recoding analogue and digital channels. Relay records 10 nos. of disturbances (FIFO) and stores it into non-volatile memory. 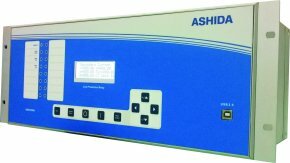 ASHIDA’s line protection have features like Event Recording, Disturbance Recording and Fault Recording. Ashida’s wide range of Relay options enables the customer to choose appropriate and economical solution.